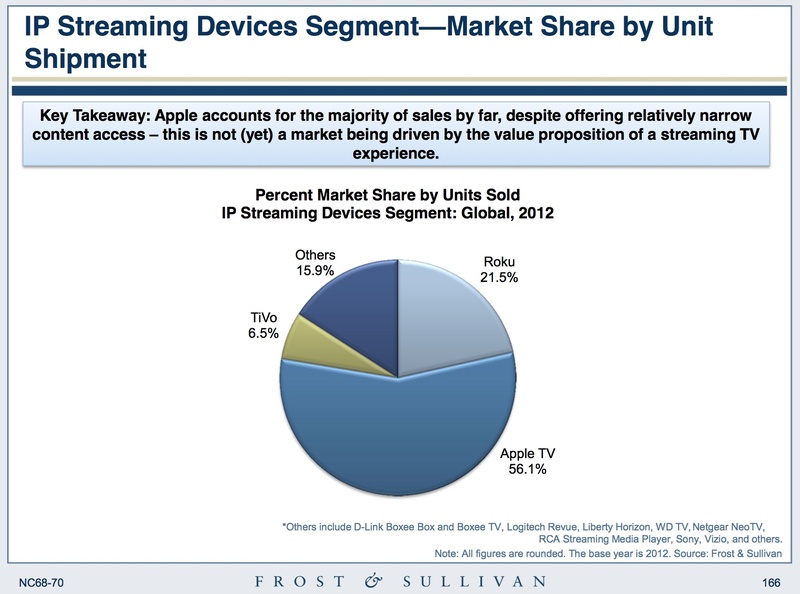 Apple (S AAPL) TV accounts for 56 percent of all streaming devices sold worldwide, according to select data from the Consumer Video Devices Market report published by market research outlet Frost & Sullivan this week. Roku is a not-so-close second with 21.5 percent of all global device sales. The executive summary of the report blogged by Rayburn doesn’t break out individual numbers for each vendor, but we know that Apple TV sold more than 13 million devices by the end of Q1 2013. Roku announced in April that it has now sold five million players in the U.S.. We don’t know how many devices Roku has sold outside of the country, but the company’s international presence is so far limited. Other vendors haven’t released any sales numbers, but Frost & Sullivan estimates that none of them sells more than one million devices per year. Absent from this data are game consoles, which account for the lion share of online video streaming to the TV. Sony’s (S SNE) PS3 has long been the most popular device for Netflix streaming in terms of bandwidth consumed, followed by Microsoft’s (S MSFT) Xbox 360. This story was updated at 11:35am to reflect that only the device sales data was released online this week. The report itself has been for sale since late April. where are connected bluray players and tvs in the equation. I was streaming netflix from a bluray player a long time before apple and roku were on the scene. I bought my first AppleTV in 2007â€”6 years ago. Been streaming for six years. When did you get that BlueRay player???? Thinking about it I was wrong my first Netflix device was my Toshiba HD DVD player so that’s what 8 years ago? Netflix started in 97 if I’m remembering correctly. So your AppleTv was first gen then? Did it have Netflix out of the box? Netflix didn’t start to stream video online until 2007. PPTV has 175 million subscribers in Asia- is everybody watching on PCs over there? Actually yes, most people are. Chinese vendors have largely given up on set-top boxes for the time being, because that would make them TV distributors and require a whole different and vastly more complicated set of state licenses. NetFlix wasn’tâ€”and still isn’tâ€”available on the AppleTV 1st Gen.
Second Gen AppleTV released in September 2010 included NetFlix. Third Gen also includes it. I have been streaming since 2007, primarily via the iTunes Store. I also use NetFlix on 2nd and 3rd Gen Apple TV’s. agreed. I use smart TVs in most rooms of my house to access Pandora and Netflix. Simple apps will allow your phone/tablet to show up as a network drive on your local WAN and either my Blu Ray player or Smart TV will stream from those devices as well. I donâ€™t know many people that are buying streaming only devices. Seems consoles, Smart TVâ€™s and Blu Ray players make up the majority. jmho. I bet those figures don’t take into account people running OpenELEC and other XBMC distros on Raspberry Pi (which also supports AirPlay). They also don’t take into account Martians streaming pirated Netflix from their spaceships, but they probably have a similar marketshare to Pi users running XBMC. Apple usually knows what are they doing.